Ike wants to write a story – an incredible story – but something seems to be missing. What does Ike need to get his ideas down on paper? Ink! Of course! Join Ike as he goes on an amazing adventure to collect everything he needs to create the ink that will allow him to write his incredible story. As an aspiring author, I couldn’t help but smile at Ike’s procrastination at the beginning of the story. He is ready to write his incredible story so he spends time finding his favourite pen, chatting with his best friend and doing some cleaning. It sounds eerily familiar. What I love most about this story is that it is Ike’s adventure to find just the right ingredients for his ink that form the basis of his story when he eventually sits down to write. The wonderful, interesting and odd things he experiences are woven into his story. Creative thoughts inspired by amazing real-life experiences that are a little bit strange and more than a little bit messy remind readers that creativity really is about the journey, not just the destination. 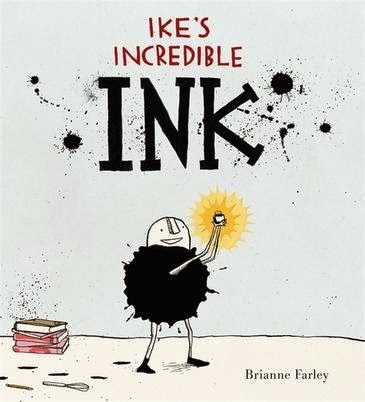 Ike’s Incredible Ink is sure to delight creative thinking children as they follow Ike’s adventure to find his story and enjoy the quirky illustrations by author/illustrator Brianne Farley.